This recipe is inspired by Delia’s “Pile-it-High Orange and Rhubarb Meringue Pie”, from her Summer Collection. Plenty for 6 people, will serve 8. Start by making the pastry. Sift the flour and icing sugar together, rub in the fat (or place in food processor and blend) to form fine bread crumbs. Add the egg and brandy. Mix well. The mixture needs to bind together, you need less liquid than you think. If you need a bit more, add some cold water. Wrap in cling film and chill for at least 2 hours, but preferably overnight. If you do chill the pastry overnight, remove it from the fridge 30 minutes prior to rolling. Grease the tin with butter and roll the pastry out to fit. Line the tin and then chill for at least 1 hour (this is necesary to prevent shrinkage). Preheat oven to 190C, 375F, gas 5. Prepare the filling, slice the rhubarb into 5cm chunks. Place in a baking tray add 1/2 the sugar and a dash of water. Place in oven and bake until soft (approx 10 – 20 minutes depending on the rhubarb). Allow to cool slightly. Whilst pastry is baking, finish filling. Mash the rhubarb and taste, add sugar to achieve the sweetness you like. Add the orange zest, crushed juniper berries and egg yolks. Mix the orange juice with the cornflour, add to rhubarb mixture. Add to a thick bottomed saucepan and gently heat, stirring continuously with a wooden spoon. This will thicken after 5 – 10 minutes. Be patient, if you heat too quickly the eggs will curdle. Now make the meringue – whisk the egg whites until they form soft peaks. Gradually add the sugar whilst whisking. You should end up with a firm mixture. 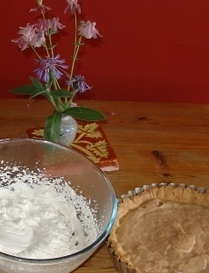 Once pastry is cooked, add the thickened rhubarb mix and then top with the meringues. Place in oven for around 25 minutes, lower the heat a bit after about 10 minutes. Allow to cool for 2 hours before serving. This is best eaten within 6 hours of making (don’t chill). 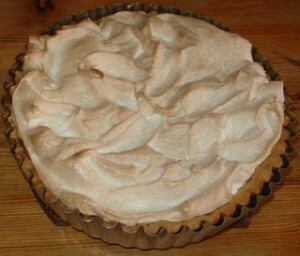 Left overs should be chilled, the meringue will suffer slightly.